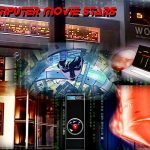 Computers which starred in classic sci-fi movies, helped to shape the dreams and perceptions of modern day computers. See your favorite Computer Movie Stars, (that’s the machines, not the wetware!) at our next Atlanta Historical Computer Society meeting on Saturday, April 28th at 2pm. Dave, Brad and Steve are going out on a limb to present clips of their picks for the most interesting ones from classic films. So come prepared to argue for your favorites in the lively discussion that’s sure to ensue! This entry was posted	on Sunday, April 22nd, 2012 at 1:50 pm	and is filed under Meetings. You can follow any responses to this entry through the RSS 2.0 feed. Both comments and pings are currently closed.